This Reference Article defines and explains the topic of how to print labels with white on black instead of a typical black on white. There are several approaches to accomplish this task. Each is listed and discussed below. You can purchase a black label stock and white printer ribbon. However, the design user have to pay close attention to the label design. The user needs to keep in mind, as they design, that black is white and white is black. This can get tricky. One example of where thinking ‘in reverse’ can be difficult is thinking through your barcode. Most scanners are designed to read barcode in reverse colors. However, the barcode pattern (contrasting dark and light stripes of different widths) must be the same but the scanner will expect the colors (e.g. black and white) will be reversed including the quiet zone around the barcode. Therefore the label designer MUST use the reverse feature on the barcode to switch dark lines to white and white spaces to dark lines. The ribbon is used at the same rate regardless if how much of the ribbon material is used. Therefore, a more cost effectively way to print back labels is to use white labels but reverse the colors in the label design. Use the ribbon to print a black background and not print where you want white characters, images, or barcode to appear. 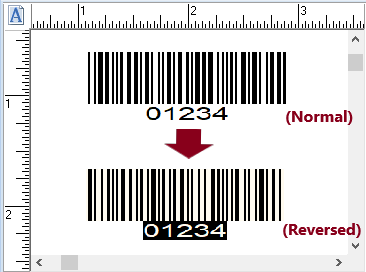 The same ‘in reverse’ thinking is required, however, when printing barcode. 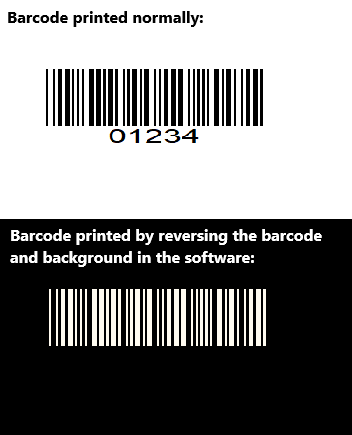 Since the software is not checking the barcode against the background you give it, it will likely default to printing a back-on-white barcode instead of reversing it. Thus, as with the “Use Black Label Stock and White Ribbon” approach, you will need to remember to use the reverse feature for the barcode. The simplest and lowest cost way to make black labels with white data is to use a feature that is available in the printer driver. This feature may have different names – “Negative”, “White on Black reversed”, “Reverse Overlay”, etc. However, not all printers will have this feature. With this feature, the label design will does not have to change and you can print the labels on white label stock. Since the driver is doing the reversing for you, you will not need to think ‘in reverse’. The barcode bars and white spaces will be switched automatically as with all other aspects of the label.